A hotel isn't like a home, but it's better than being a houseguest. 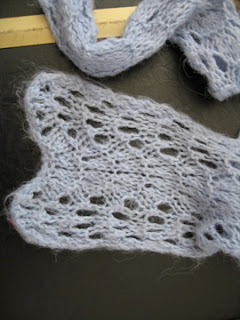 I feel so very far behind on the blogging relative to the knitting. There's just been so much knitting going on. Here's the project that took my whole bathtub to block. It's a gift, so we'll save the big reveal for later. Like my Bird in Hand Mittens. 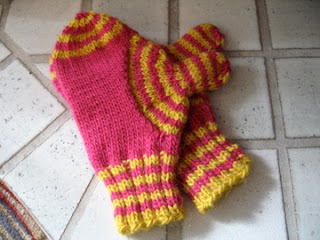 And other mittens, photos coming later. Because my Selbuvotter finally came in the mail. 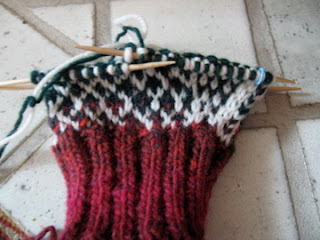 And I love knitting with KnitPicks Telemark. More on the way. And while I'm waiting for more yarn to finish those mittens, I pulled out a whole bunch of yarn for otehr mittens. Think I'll ever stop? Did you know that Lantern Moon will replace broken dpns for free? Just email them. I just got my Hogwarts Swap 2 from my pal. It's awesome. 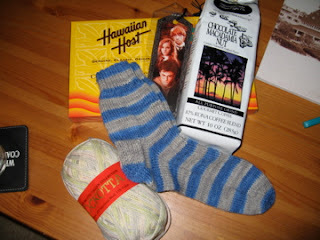 And also awesome, she felt bad it was late, so she sent me a Blue Moon Fiber Arts. Check out my new Socks that Rock! Stay tuned for a wrap up of a very successful kniting January, and some new exciting plans for February! Welcome back to Time Machine Tuesday, on Tuesday this week, for a change of pace. This week, I give you the two cutest baby photos ever, courtesy of my college roommate and her adorable boy. You last saw him at the ripe old age of 14 days, when his bear was larger than he was. Now, check out how he's growing into his knitwear! 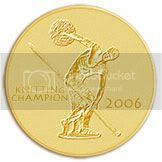 Since these knits are circa 2007, I'll just link to their original posts. Interestingly enough, both are from the same Debbie Bliss book. 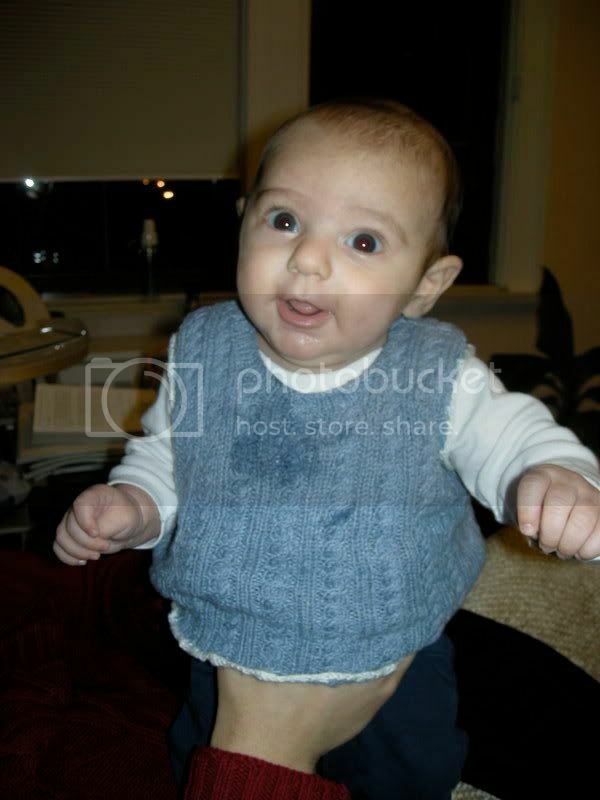 Find out all about the vest pre-baby drool here. And, for the winning cute picture of the day, see below. The details about the hooded sweater are here. Who knew that the dad's favorite color is orange? Verdict on these knits? They seem to be holding up to baby laughter, foot grabbing, and drool just great. 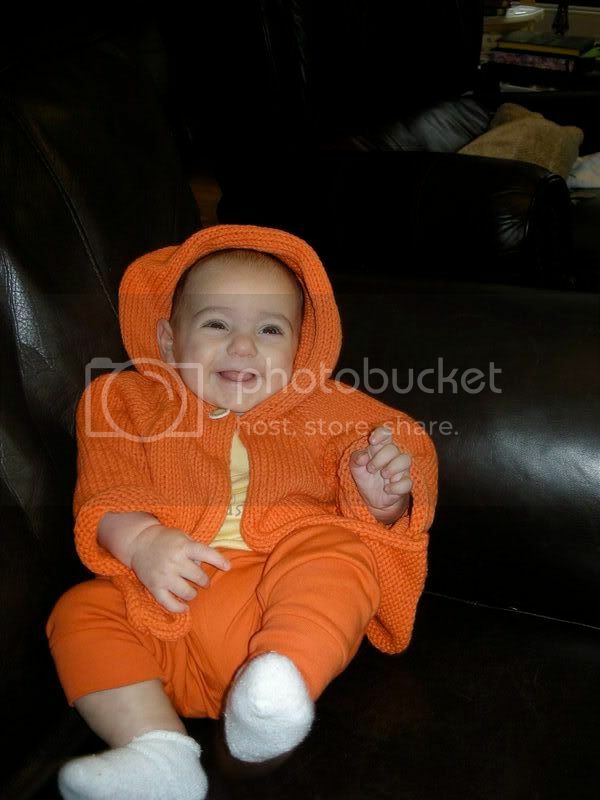 And as far as cute-ness? That's the winner. Happiness is having a large, close-knit, caring family in another city. When was the last time you had to fill a whole bathtub to block your project? The thing I miss about Air Force One is they don't lose my luggage. Welcome to Time Machine Tuesday, brought to you on Wednesday this week by the fine folks who left me stranded in Houston yesterday after assuring me three times that I would make my connecting flight. I mean, really - wouldn't you rather be stranded with your husband instead of some airport motel? I think so. At any rate, it's hard to get too upset after a phenomenal weekend on the Gulf Coast and New Orleans. Not only was it full of fun new sights and good food and buildings older than 20 years, but it was also cold. Highs in the low 50s meant that most of the day and night it was in the 20s and 30s. And that meant great scarf and mitten weather. So, today, we'll explore some scarves for Time Machine Tuesday. Mostly because these are the photos I already had loaded up and, as stated, I'm stranded in Houston. Hmmm . . .
Notes: This is a great concept for a scarf, where-ever I first heard it. It was fun, easy, and a little too addicting when I was making it. Actually, I made two and the second I gave away. I used a worsted weight grey yarn as a base for this and knit with that every 3rd row, for balance. Wearing Notes: As you can see, this is a little worse for the wear. So much so, that I'm tossing it after the photo shoot. The culprit? The chenille. Worms are ugly. Best Thing About This Project: It used to look awesome with this leather jacket I wore in med school. Plus, I always love a good "something from nothing" knit. Notes: Fun, easy pattern. Lots of bang for the buck. Makes a skinny scarf. Wearing Notes: This scarf, too, used to look great with that leather jacket. The yarn has lost a lot of its original body over time, and it's soon heading for the Goodwill box. 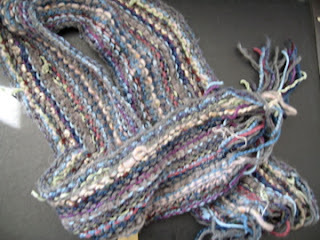 But it got a lot of wear, and for a total yarn cost of around $5, I think I got my money's worth. Best Thing About This Project: I loved having a whole scarf collection to pick and chose for the day or occasion. This was a rather valued member. Next up: The scarf that took on New Orleans with great aplomb. It's a good thing I have tiny hands, or I'd be inclined to keep these mittens for myself. 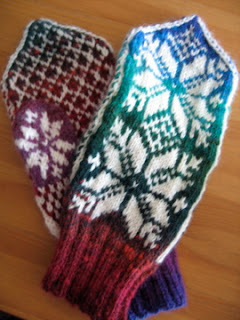 I am totally in love,* with the colors, the snowflakes, and the awesome twist on a very traditional mitten pattern. Notes: See the errata! But now that I've figured it out, I do like the Norwegian thumb gore. It's a combination gored thumb and peasant thumb that I can see having many applications in stranded patterns, and fits better than a standard peasant thumb. Best Thing About This Project: The wacky colors. *Yes, I've been in love with all of my knitting lately, why do you ask? That way when you criticize them, you are a mile away from them and you have their shoes. That was easy. This whole Knit-A-Mile challenge over at A Loose Knit Group. Done. Nearly a month early. By the way, I got a phone call from my dad the other day telling me that my OCD tendencies are really coming out in my yarn stash spreadsheet. Hmmm . . . This is overall, good news for the stash, although a few skeins of sport weight are accompanying my copy of Selbuvotter, which is finally on its way to me. January is just a great month for mittens, isn't it? Stretch your arm no further than your sleeve. If brown is the new black and pink is the new brown, I declare that, for 2008, sleeves are the new socks. Sleeves are the new go-to portable knitting projects. Sleeves are the new knitting-while-reading project. 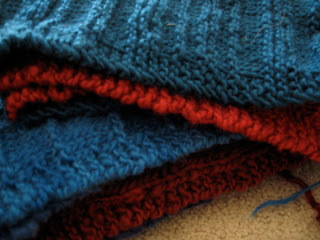 Sleeves are the only way that my somewhat ambitious knitting plans for 2008 are going to come to fruition. There's always a portable project, right? There's always something in your purse, backpack, or pocket of your white coat for those found and opportune moments, like waiting in line, pumping gas, or going to noon conference. Traditionally, I knit socks during these times. They had all the qualities in question - small, lightweight, easily-memorized patterns for maximal not-looking-at-my-knitting. Turns out that the first 15 3/4" of the Salt Lake City sleeves fit all of these criteria. So instead of slogging through 15 3/4" of stockinette on US3s in the round during my perfectly good knitting time at home, I got it done here and there. So when I did get home, it was the fun color chart that awaited me. And I dove right in and had a blast. Now there's just that 15 3/4" of the plain stockinette body to do . . . Perfect plane knitting for my weekend trip to see my husband, and New Orleans. It's Tuesday again, and we're back for another trip in the time machine! I love this sweater. I do not love self-portraits, although my sister gave me a little flexible tripod for Christmas, so this may get better if I experiment more with the self-timer. But I digress. Needles: don't remember - US 7, maybe? Notes: I only made one modification, which was to work the intarsia panels on both fronts rather than just on the left front. Call me square, but I like symmetry. Wearing Notes: The yarn has pilled a bit, but nothing that can't be picked off. The only real signs of wear are around the edges of my first-ever sewn-in zipper, which I really should tack down one of these days. If I were to make it again, I might mess with the collar. It takes some fuss (and steam) to make it lie right. Overall, wears very well. I made this sweater my first semester of medical school. 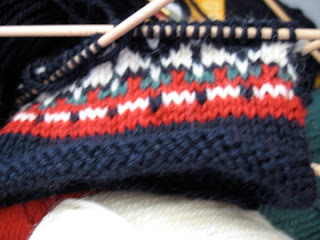 It's knit in one piece with the two front panels of longer stripes knit intarsia style. The edgings are corrugated ribbing, which - as you all know - looks cool but is not terribly fun to do. Overall, it was a great easy knit that I still wear a lot 5 years later. It probably sees more action than most of my more complicated sweaters, and periodically I toy with the idea of knitting it again, this time in Kureyon Color 40. I already have 3 skeins of it, so I'd only need another 6 or 7 skeins . 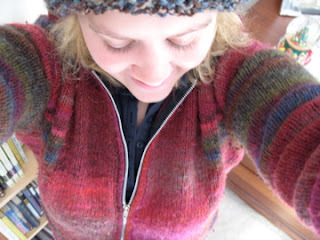 . .
And here's a better photo of that hat, which I wore to work this morning (it was 39 degrees and my hair was wet). 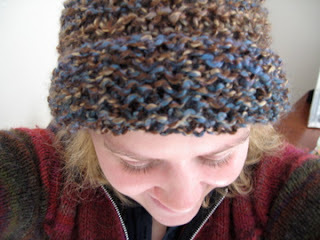 This is a simple garter stitch hat in leftover Lion Brand Homespun. No pattern, just knitting and decreasing. Very versatile. More important - very stretchy to go over my bun and not mess it up. 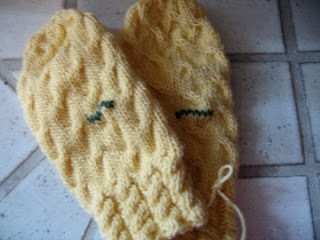 Coming soon - you guessed it - more mittens! in a field and don't notice it. Houston, We have a problem. 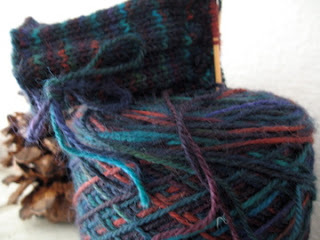 Remember my big resolutions to knit big projects? Turns out I'm hopeless in the siren call of the mittens. I stalk my mailbox waiting for the yarn to knit Very Cabley thumbs. I knit mittens, dream mittens, browse Ravelry for mittens. 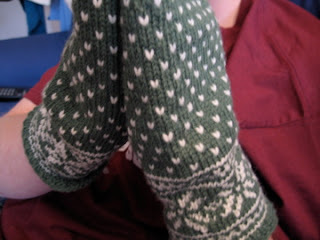 And then I saw these Wacky Selbu Mittens and I was sunk. I had the Kureyon (top ends in blue and purple - it's a great colorway). I had the contrast color. 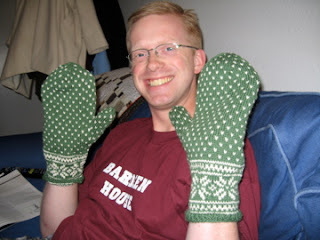 I had Folk Mittens. But it wasn't all peachy keen. There was an error in the pattern. A big error. A fundamental problem with the Norwegian thumb gore. Essentially, a Norwegian thumb gore, as it really not made clear in the book, "borrows" palm stitches on the palm side. Oh, and the cast on number and the thumb chart were wrong. Oh, and I didn't notice the big *errata* sign on Ravelry, so I had to knit it twice before I realized it was the pattern and not me. This raises an intriguing question about a future knit - my Bed and Breakfast Pullover. I was thinking of this in an aqua/turquoise sort of color, but now that I've met this French Blue color, I might be changing my mind. What do you think? Notes: At first I took a look around Ravelry, I was worried. Some looked weird. But like much knitting, it's all in the blocking. Best Thing About This Project: It was just good plain knitting fun. And coming up soon . . . the Very Cabley Mittens. I thought I had "most" of a skein of Lamb's Pride in this Sun Yellow color, but apparently not quite enough. I'm missing the thumbs. Enter Ravelry. I was able to sort by color and find someone who had a partial skein of the same yarn in the same color, and we arranged a little trade of partial skeins. How handy! In the meantime, what should I knit while waiting for that yarn to arrive? More mittens, perhaps? Creativity is a high-falutin' word for the work I have to do between now and Tuesday. This is a most unexpected entry for me in the Time Machine Tuesday category. What? You forget what Time Machine Tuesday is? It's a chance to look back at mine, your, our handknits of ages past and see what's come of them. Resounding successes? Complete failures? Hardy yarn or pilling like crazy? How is it wearing (or not wearing)? What would you have done differently? 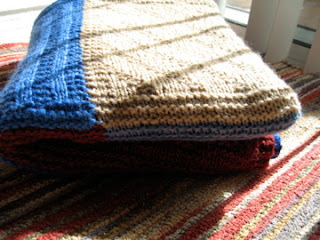 And what are the great knitting acheivements you accomplished pre-blog? Show them off. 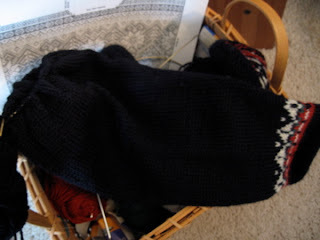 Today's entry hardly qualifies as a great knitting acheivement, but it was pre-blog. In fact, until a couple of months ago, this sweater fell into the complete failure category. I never ever wore it. But let's not get ahead of ourselves. Best Thing About This Project: Its resurrection. What are those too many notes, you ask? 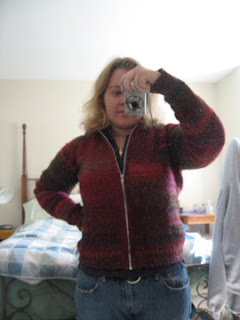 This sweater, from a knitting perspective, is still a pretty dismal failure. And it's actually the third sweater I knit out of this yarn over several months. So let's talk about a horrible combination of yarn and pattern, shall we? It's a nice fluffy yarn, and the varigations are much more subtle in person than in that flash photo. It's soft, although there's a halo that can be a little itchy. But it's just not a great yarn for this pattern, or any of the other patterns I tried. It's lofty and light, the exact opposite of the heavy, drapey Gatsby called for, and the sweater has a tendency to pull up and out. The pattern calls for waist shaping near the midline, and it looks ridiculous in this yarn. And while the colors don't flash quite as much in real life, there is some unattractive pooling around the waist. Overall, just something I don't really want to wear in public. So I didn't. And I still don't. The saving grace of this sweater came some time in November when it turned chilly (hey - it gets into the 40s and sometimes even 30s at night!). I was at home, in my pajamas, and all my hooded sweatshirts seemed too bulky. So I reached into my chest of sweaters and pulled out this one. And it is the absolute perfect Gray Comfy Sweater. I now wear it almost daily over my pajamas (see how good it looks with pajamas? ), which makes it the single item of knitwear I wear the most. Ironic, isn't it? and shows beside a preference, always to be esteeemed, for the future. I'm following along on the Stash Knit Down 2008 over at Ravelry (echoing my fellow knitbloggers when I ponder - how did we ever live without it? ), so you may be seeing a few progress reports popping up. Especially given today's onset of the January Challenge - to knit a mile of yarn. Yup, 1760 yards of yarn. Good thing I'm knitting an enormous sportweight sweater! A few clarifications - a skein in my spreadsheet can be 25g of bulky something or a huge cone of laceweight. It, in general, includes only full skeins. The big basket of sock leftovers, or the bigger basket of other leftovers, aren't generally counted, although I do tally partial skeins when they are part of a lot (e.g. 3.5 skeins of Cascade 220 leftover from Am Kamin). The goals: A little modest stash reduction. Most of my stash I love and plan to knit. Some of it I'd passively part with on my Ravelry page. And a few things I'd actively like to get rid of (maybe 5-10 skeins, not much). 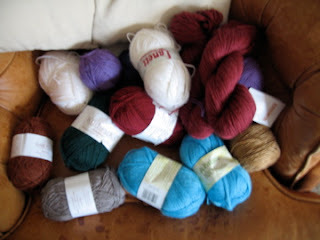 Mostly I would just be comfortable with a smaller stash, so I feel less guilty buying yarn. Most of my stash - believe it or not - is not sweater quantities of yarn. Lots of laceweight, lots of sock yarn, lots of small lots of things. So everytime I want to make a sweater I have to buy yarn. For the most part, I like this because I buy the right yarn for the sweater, but then the stash goes unknit. Hence, Knit Down the Stash. 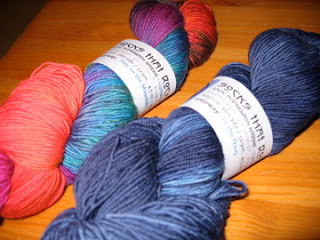 Yesterday I returned some yarn for the first time ever, some Manos that didn't make the cut for the throw. I returned 2 skeins in exchange for 3 of Cascade 220, so I'm now up in both skeins and yardage from the transaction, but since I have near-plans for the Cascade and none for the Manos, I get points for increasing the usability of the stash. January is for many things - you've already seen my Manos Throw, Salt Lake City sweater (more coming on this soon), and my new Bearfoot socks as a promising start to a new year of knitting. 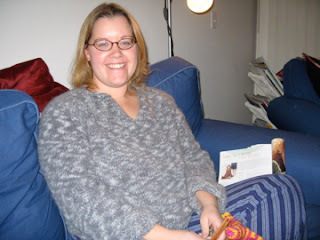 I've also bought into the premise of A Loose Knit Group (Yahoo/Ravelry), attempting to knit ahead for the holidays. There's a theme to every month, and this month it's mittens and gloves. 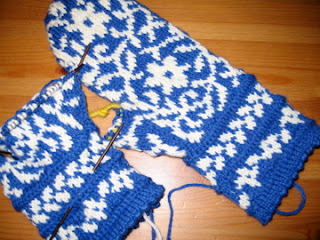 How handy that I'm currently in the middle of a mitten-fest! The first pair of mittens was actually started even before I heard about the group. 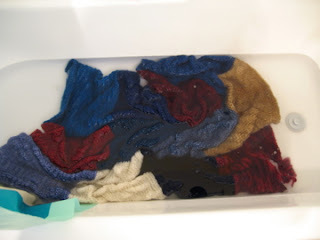 You may recall the complaints of my poor husband who doesn't have enough handknits (or so he says) when I ripped out the Baltic Mittens he'd claimed. I promised him another pair, and sent him a long list of links for his perusal. His choice actually surprised me a bit. Turns out that he's a traditionalist. (Which I suppose makes sense given his interest in Dale sweaters . . . This could be very good.) Turns out I have a lot to learn to knit for tall people. It's a good thing he was around to try them on as I went, because I was seriously underestimating how much larger his hands are than mine. So seriously, I had to re-do one of the cuffs. But it worked - do you see how happy the recipient is? Notes: I made several modifications, all for size. 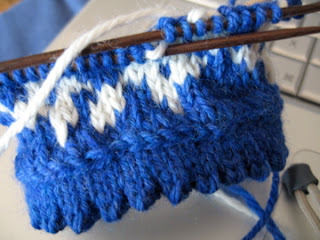 I knit on US2s at a gauge of approx 7 sts/in instead of the 9 sts/in called for. This gave me the hand circumference I needed with the 80 pattern stitches. The pattern, however, makes almost no allowance for the cuff to be smaller than the hands, which didn't make sense to me. So I cut out one pattern repeat of the snowflakes and started with 70 sts and then increased for the hand. If I were to make any other mods, it would be to recongize that my row gauge changed as well, and I would have started the thumb gore a little earlier. 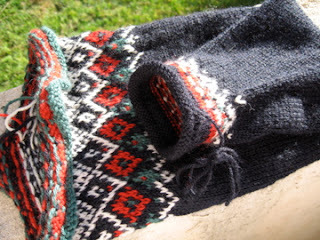 Best Thing About This Project: This photo - I love these mittens, but I'm not sure they qualify for my Loose Knit givne how quickly they were snatched away. So I started another pair I'd had my eye on, and am contemplating a third. Coming soon, with photos, something far less traditional. You'll love it; I promise. I was trying to think about how to sum up my plans for 2008, when Jen did it for me. Less whimsy, more things people want. That pretty much sums it up for me. You may also recall that I had plans for a Clean Slate for 2008. I'm pleased to say that I did it . . . by mid-December. I finished the Christmas knits, my Denim Aran, and searched around for a new project. 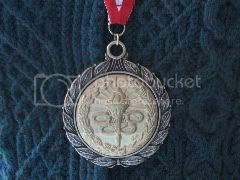 I found it in the Four Seasons Throw made of Manos del Uraguay. I saw Disentangled's in person, and was completely won over. A long road trip, and having my husband around to drive, and before you know it I'm done 6/12 squares. Then I did wait until it was nearly January to start my 2008: A Year of Yarn. As I said earlier, not all the yarns are particularly hard to find or unique, although some are, but all are somehow special to me. 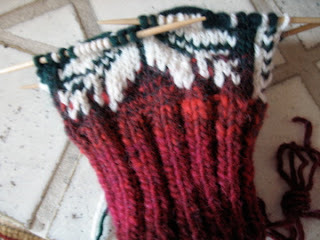 For January, I'm knitting up Mountain Colors Bearfoot, in Glacier, in Nancy Bush's Rib and Cable pattern. My first time knitting with Bearfoot, and I'm loving it. And, perhaps most significantly, my January Project: Salt Lake City from Dale of Norway. For that husband who drives me around so I can knit. Let a year of yarn and sweaters begin!